Heat oven to 350°F. In large bowl, break up cookie dough. Stir or knead in flour until well blended. Work with half of dough at a time; refrigerate remaining dough until needed. Shape dough into 16 (1-inch) balls; place 2 inches apart on ungreased cookie sheets. Repeat with remaining dough. Bake 8 to 12 minutes or until light golden brown. Cool 1 minute; remove from cookie sheets. Cool completely, about 15 minutes. Meanwhile, in small microwavable bowl, microwave candy coating on High 30 seconds. Stir; microwave in 15-second increments until melted and smooth. Set aside. With can of decorating icing fitted with star tip, pipe 1-inch star of icing (about 1 teaspoon) on center of each cookie. 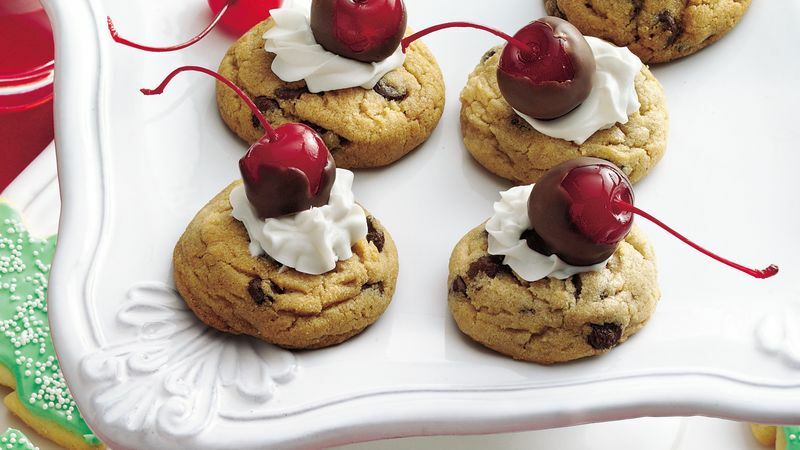 Dip cherries into melted chocolate; place on white icing on cookies. Let stand until icing is set and chocolate is firm, about 20 minutes. Store between sheets of waxed paper in tightly covered container. Maraschino cherries without stems can be used in place of the cherries with stems.